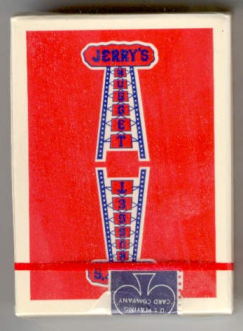 Original, Vintage Jerry's Nugget cards, red-back, still sealed: Brand New (sealed) $347 per deck. Extremely limited quantity. 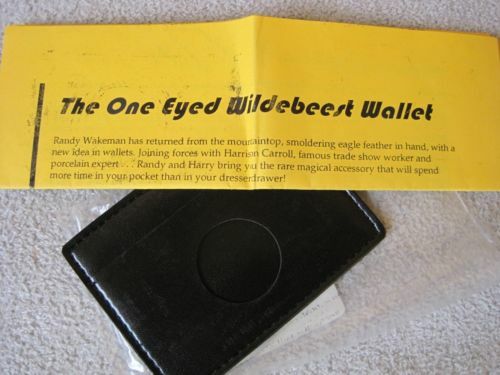 The One Eyed Wildebeest Wallet, developed by Randy Wakeman and Harrison Carroll. It is a small utility switching device wallet. You can effortlessly switch envelopes,cards, paper money, etc. It is easy to carry, easy to use, and disarmingly deceptive. A sensational Balducci/Kaps card to wallet, without compromise. For performers who will settle for only the BEST! The finest butter soft black leather obtainable. Elegant, nylon lining - built to last. Designed totally from scratch: there is no equal! World class quality domestic cowhide, tanned in the USA. A trouble-free loading method that leaves NO visible openings! FINALLY! A prop that does not look like a prop! FINALLY! A card in wallet that is the right size! Just 3 3/4 x 6 7/16! FINALLY! A card in wallet with proper stitching & attention to detail! No wonder that Jon Racherbaumer, Tom Gagnon, Jim Sisti, Paul Cummins, Harrison Carroll, Simon Lovell, Bruce Florek, & Andrew Pinard use it, and have found it to be the best working performer's wallet ever produced. Randy's Rainbow Deck II is the most stunning blockbuster finish to a magic routine you can imagine! Directly put, this is the most fabulous deck of cards ever made. Far from a "one trick wonder," this professional prop is fifty-two effects in one. And more! For years, magicians in the know have gladly paid over $100 per deck for barely adequate custom "rainbow decks." That's why the original "Randy's Rainbow Deck" was such a smash hit and quick sell-out! It's all-new, and it's back with more striking backs than ever, and it is gorgeous! Basic Effect: The close-up Miracle-maker explains that there is a single card with a "slightly different back" from the rest of the deck he has been using. 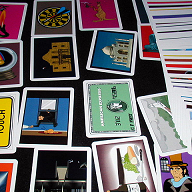 The spectator's freely selected card is shown to have a wild and crazy full color back. For the grand finale, the entire deck is ribbon spread face down to reveal an explosive, dazzling display of fifty-two completely different BREATHTAKINGLY FULL COLOR BACKS! COMPLETELY DIFFERENT full color images from the original 10,000+ selling, sold out Randy's Rainbow Deck. The magical applications never end! Quantities are limited. To avoid disappointment, order yours today! We are not saying that "Backs to the Future" is the BEST close-up card effect ever released... but many people have, and we are not arguing! A devastating twisting effect, and a knockout color change effect from Bicycle Blue to Bicycle Red to authentic Golden Nugget cards. The final change blows away the even the most hard-to-please audiences! "That sure is pretty! Not as pretty as I am, but that sure is pretty!" "Now that's cool, brother! It's one of the wildest things I've seen. Tell all your buddies the Hulkster said so!" "That's not just good, that's crazy wild good! It's something like that, that reminds me how great Magic can be!" 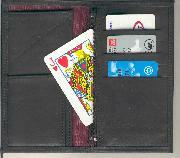 Even a protective poker-sized wallet for your new miracle. It kills. It is easy to do. It is something people cannot forget. It is the "Mercedes" of in-the-hands Magic! And, it is all yours for the ridiculously low investment of $20.